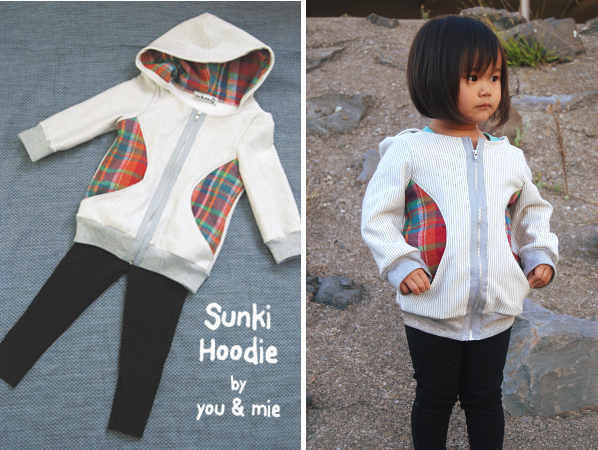 I decided to take the stylish Sunki dress and make a comfy knit hoodie for my toddler. The original pattern is a beautiful dress with some really unique and fun elements like the very visual pockets, the overlapping shoulder seams, and the pleated sleeves at the shoulders. I love the shape and style of the original Sunki Dress and those oh-so-identifiable pockets. So I wanted to keep the general silhouette and modern feel from the pattern. 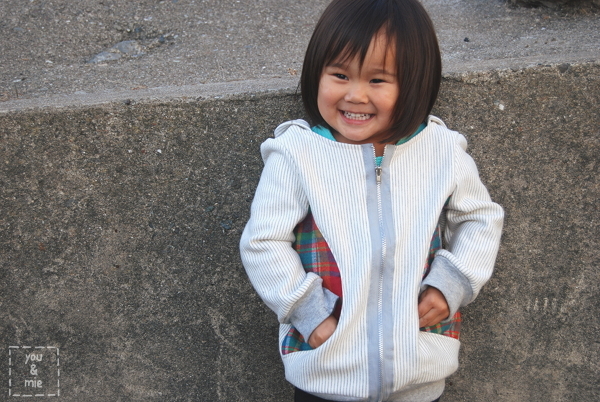 But my daughter really will only wear comfy knit clothing and with the weather getting colder, I thought a little zip up hoodie would be perfect! 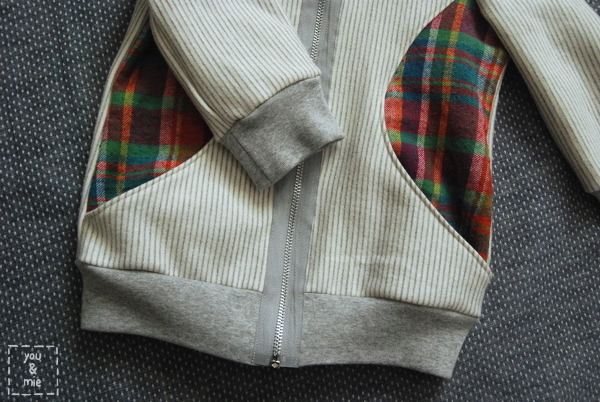 To flip the original pattern into a zip up hoodie, I made the back one pattern piece and omitted the zipper. In the front, I left the pockets exactly the same, but split the pattern into two pieces. I added width to both the front and the back, since this was meant to be outerwear, I wanted to make sure it would be roomy enough to wear over layers. I changed the shoulders from the overlapping pieces to a regular shoulder seam since I wanted to add the hood and omitted the facing pieces. I left the sleeves pretty much the same except instead of pleating them at the shoulder, I did a slight gather. The fabric I used is a thick and cozy sweatshirt knit, so it would have been too bulky to pleat. But the gathers still give it that slightly poofed look. I shortened both the sleeves and the body of the “dress” and added cuffs for a more casual and fitted look. I chose an exposed zipper down the front for an added visual element. It was my first time using an exposed zipper and I love it! The oversized hood is lined with a warm flannel and is perfect for bundling up when it gets chilly! I used one of my daughter’s store bought hoodies to draft the pattern for the hood. I decided to sew up a pair of Sunki leggings to go with the hoodie, but stuck with the original pattern. They were a really fast and easy project to make and I can see myself making a bunch more of these for my daughter! And that’s my Sunki flip! I really enjoyed sewing this hoodie and the leggings and I hope you like them too! Thanks for letting me be a part of this fun project, Ashley and Emily! And thank you to Shelly of Figgy’s for providing us with the Sunki pattern to flip. Now, if you haven’t already, head on over to VOTE for your favorite Sunki flip! Voting is open from now until Sunday, October 27th at 11pm (CST). Happy Friday! 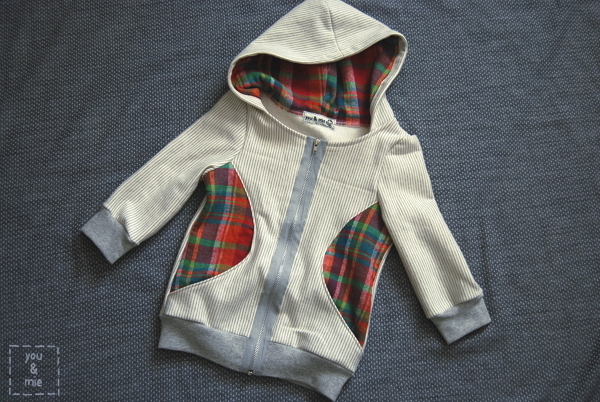 This entry was posted in announcement and tagged flip this pattern, hoodie, sunki by Cherie. Bookmark the permalink. i really love this so much, cherie. it’s perfect! and i have been obsessed with the sunki legging pattern. it is the best! 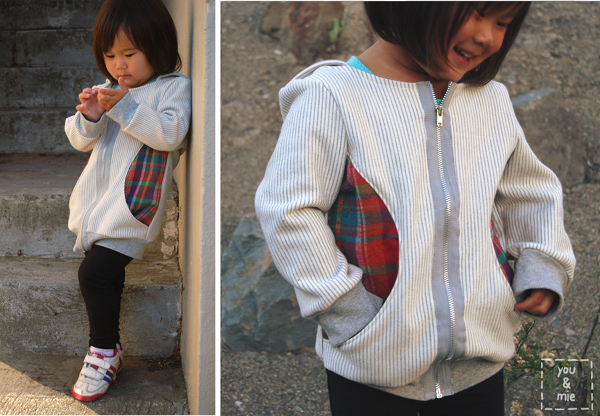 Beautiful little girl and I LOVE your idea to make the dress into a hoodie! The contrasting flannel was a great idea. I’m totally going to do this! Cherie, this is BRILLIANT! Like how much cuter could the sunki pattern get? Clearly this much. So adorable. And the plaid is just the perfect contrast. Great job!